HSRP is handled a little differently With IOS XR. With IOS you configure your standby commands under the interfaces; in IOS XR you use ROUTER HSRP. 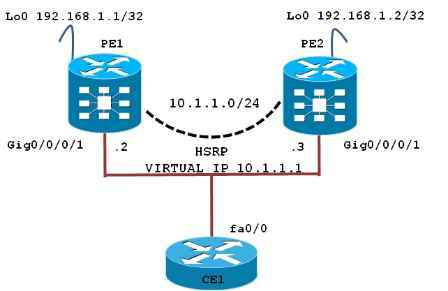 To verify configuration on HSRP router use “sh running-config router hsrp” command. To verify HSRP states use “show hsrp” command. From the above output you can see that 10.1.1.1 is group address for group 1.we are active router and 10.1.1.3 is address of standby router.Local router priority is 110. Everything is same except preemption and priority. P indicates configured to preempt and default priority is 100. To see detail information you can use “show hsrp detail” command.